Kumamoto Prefecture (in Japan) official YouTube channel "Movie! Kumamoto"
Hitoyoshi fireworks fes, in 16 August 2012, in Hitoyoshi City. New original poster with Natsume Yuujinchou new illustration. 50 people win the poster on the day. Natsume Yuujinchou over 7 millions! Natsume yuujinchou vol.14, July 5, 2012.
interviews: Yuki Midorikawa and others. Hitoyoshi Fireforks Festival 2012, Natsume collabolation again! 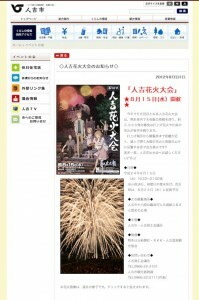 Hitoyoshi Fireworks Festival and Natsume collabolation poster again! Originally posted by cloud_orion at Go Natsume 伍 started! Very happy news came true! Phillips then introduced the release plans for the company's previous acquisition, Natsume's Book of Friends , and showed a brief trailer. The first two seasons will be included in the initial packaging, with a Fall 2012 release date, with preordering beginning right now. A Q&A session wrapped up the panel. Go Natsume 伍! Campaign starts on 2 July (UTC16:30). It's very big and world wide fan project. I am a one of the Campaign staffs. And I and J tweet on Campaign Twitter in Japanese.